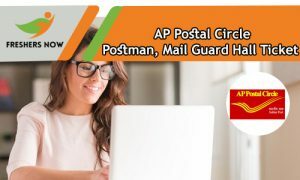 AP Postal Circle Mail Guard, Postman Hall Ticket 2019 Released…!!!! The officials of the AP Postal Circle are ready to organize the Postman, Mail Guard Examination 2019 on 27th April 2019. So, you can check this page regularly to get the information. Now, the AP Postal Hall Ticket 2019 is available from 20th April 2019. All the candidates who are about to attend the test must and should have to notify the given information. So we suggest the candidates those who want to download their valid AP Postal Circle Postman Hall Ticket 2019 can check the current post very deliberately. Also, keep an eye on the official web portal @ appost.in. In addition, to this, at the below we have arranged the valuable info about AP Postal Circle Exam Pattern, Examination Centers, AP Postal Circle Selection Process, Steps to download AP Postal Circle Hall Ticket and much more information. Therefore, follow the below sections and get the data. AP Postal Circle Postman Hall Ticket 2019 is to be released in March 2019. The AP Postal Circle Mail Guard Admit Card 2019 is an essential document to carry into the examination hall. We all know that without showing proper Postman, Mail Guard Admit Card 2019 the examiner didn’t allow the applicants to participate in the written test. So those who want to take a part in the written test on a scheduled date must and should download their AP Postal Circle Postman, Mail Guard Call Letter 2019 before the Exam Date. Moreover, you have to carry any of the id proof. In the below section, you can get the complete details. At any time, the officials will release the AP Postal Circle Postman, Mail Guard Hall Ticket 2019. At the time of the registration process, all the candidates can prefer these three Exam Centers. The selection is based on the marks secured in the Aptitude Test (Written Test), and a merit list of qualified marks. Therefore, those who secure minimum qualifying marks in the test are only eligible to work with the AP Postal Circle. Moreover, you have to reach the examination hall within Reporting Time. To avoid last minute rush it is better to reach the test center before reporting time. Also, you have to follow all the instructions printed on AP Postal Circle Postman Hall Ticket 2019. Also, carry aadhar card, passport, photography, etc id proof to the exam hall. Hit on the submit button then you can get your AP Postal Circle Postman Mail Guard Hall Ticket 2019. Download AP Postal Circle Postman, Mail Guard Hall Ticket 2019 with the help of the above link. Soon we will activate the link. Also, visit Freshers Now regularly.